The Right Stuff. . . The Luna 45 + 10 is our women's version of the little pack that could. Super rugged construction. Weighing only 5 lbs 2 oz. with fully adjustable harness system, lots of pockets and compression straps, are part of the Luna 45 + 10. Shoulder straps and hip belt are cut for a woman, or youth with rounded shoulders. This is a great first time backpack because of the easy and comfortable fit for almost everyone from 5'2" to 6'2". Although this pack is only 45 liters, it has the features of a full-size expedition backpack. This backpack works and plays hard. 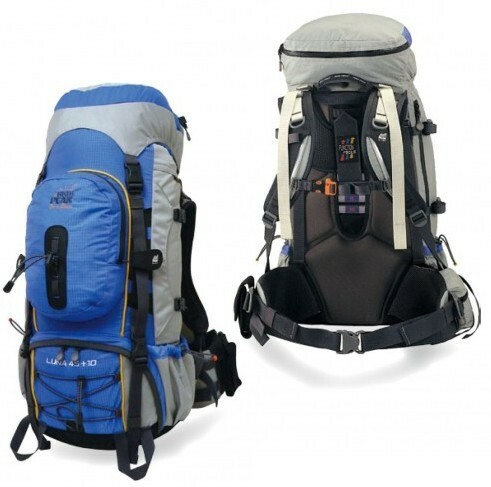 It's ideal for teen or adult trekkers. Vario Harness System - Lets you easily lengthen or shorten your harness to suit your torso.